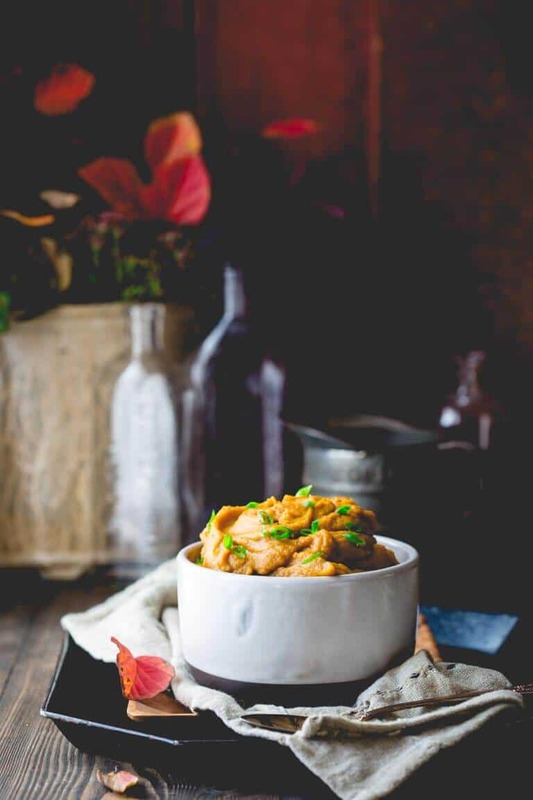 I dare you to not fall in love with these (vegan and paleo) Five Spice Healthy Mashed Sweet Potatoes. Actually, I do not think it is possible to have even the tiniest taste without declaring it to be the most amazingly delicious thing you have ever tasted. It’s impossible, I’m telling you. In fact, I’d wager, that if you serve these healthy mashed sweet potatoes for Thanksgiving, you will get at least one marriage proposal. They’re that good. And they just happen to be vegan and paleo, so pretty much everyone at the table can eat them, fall in love, and live happily ever after. The end. 1. Prep the sweet potatoes — The sweet potatoes are peeled and then steamed. This is the speediest way to cook them. And unlike boiling, steaming helps preserve nutrients. 2. Bloom the seasonings — The seasoning in this recipe is garlic, ginger and five spice. Taking the time to bloom these ingredients in the coconut oil makes them much more flavorful. To do that, simply heat the oil in a small skillet just until melted. Then add the garlic and cook it only until it is fragrant, but not actually browning. Next add in the fresh ginger and 5-spice powder. Cooking the spice in the hot oil brings out the olfactory notes and makes the spice taste much more complex. 3. Add a squeeze of orange juice — To stop the spice from over cooking, freshly squeezed orange juice is added in to drop the temp down and stop it from browning. A touch of orange zest goes in at the end. 4. Mash or puree the sweet potatoes — For the creamiest results, I preferred using a food processor to puree the mashed sweet potatoes. But if you do not have one, a potato masher works just as well! 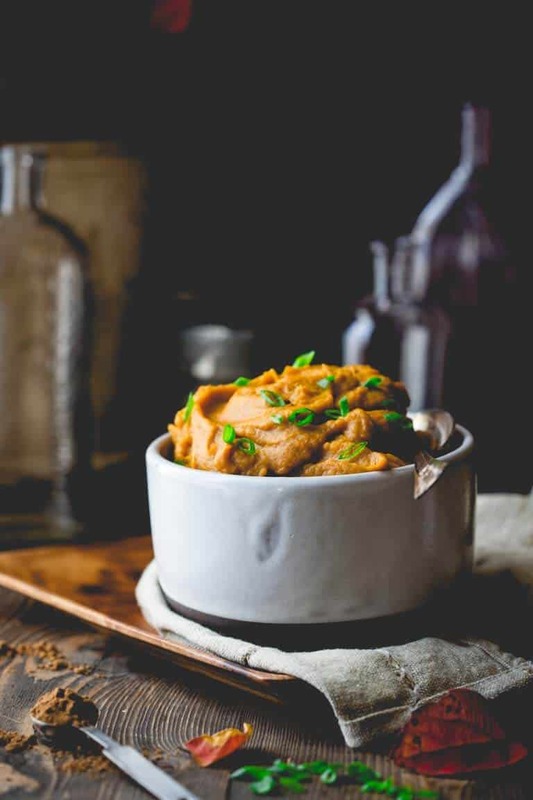 Just like regular mashed potatoes, these paleo mashed sweet potatoes reheat well the next day. To reheat these mashed sweet potatoes, portion some out into a small saucepan and turn the heat to low. Put a lid on the saucepan and give the healthy mashed sweet potatoes a few minutes to warm through. You may need to add a little water to loosen the sweet potatoes up a bit, but give it a few minutes on the heat before you add any liquid. You can also reheat mashed sweet potatoes in the oven. Put them into a baking dish and cover with aluminum foil. Cook the potatoes at 350 degrees F until they’re completely warmed through. 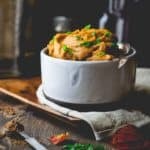 If you try this paleo mashed sweet potatoes recipe, please be sure to come back and let me know! I love hearing from you! 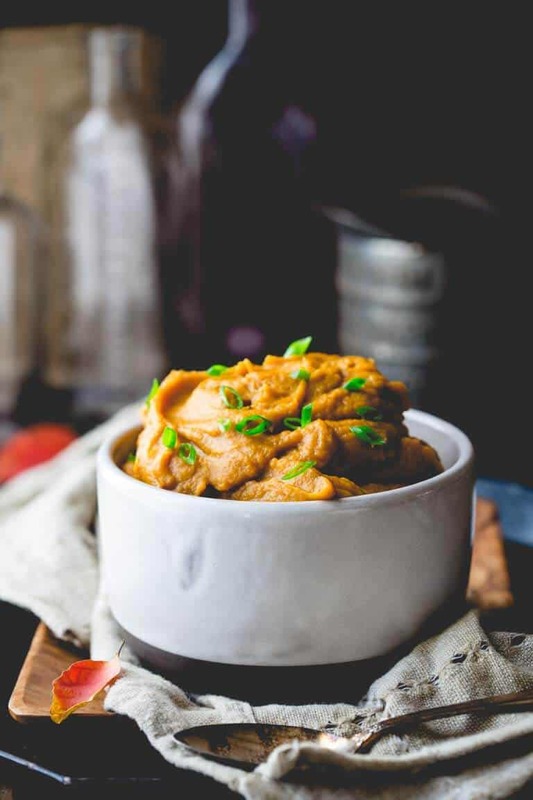 I dare you to not fall in love with these paleo five spice healthy mashed sweet potatoes! They make for an easy side dish during the cooler months. Bring 1 to 2 inches of water to a boil in a large saucepan fitted with a steamer basket over high heat. Add potatoes to the basket, cover and steam until a fork can be easily pressed into the potatoes and pulls out without resistance, 19 to 22 minutes. Meanwhile, melt coconut oil in a small saucepan over medium heat. Add garlic and cook until fragrant and just starting to brown. Add ginger and 5-spice and stir to combine. Remove from the heat and immediately and CAREFULLY stir in juice from the orange to stop the spices from over cooking. Stir in ½ teaspoon zest and salt until the salt is dissolved. Remove the steamer basket from the saucepan. Transfer the sweet potatoes to a food processor fitted with the steel blade attachment. Scrape coconut oil mixture into the food processor. Puree, scraping down the sides and mixing together once or twice, until completely smooth. 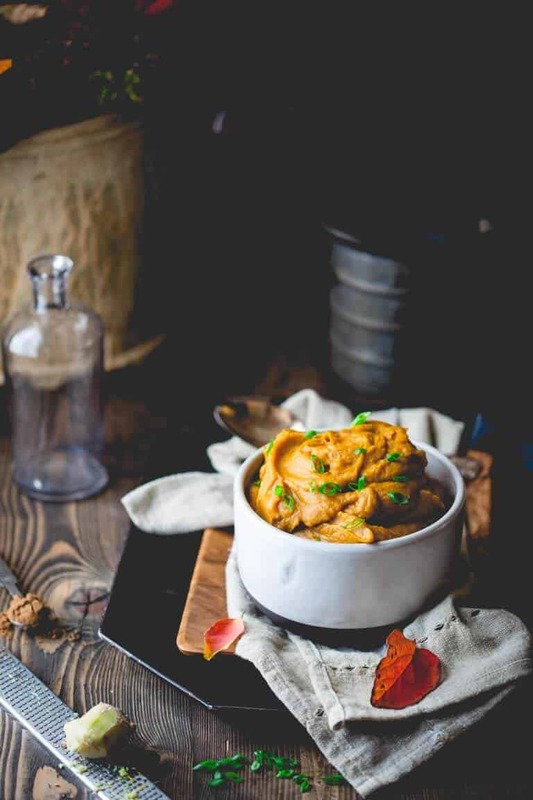 Alternatively, for a more rustic texture, pour the boiling water out of the saucepan, and dump the cooked sweet potatoes out of the basket into the hot saucepan. Pour the coconut oil mixture over the sweet potatoes and mash with a potato masher until smooth. What a delicious twist on sweet potatoes!!! I need to try this! Thanks so much Taylor! Hope you enjoy them. I’ve never added Chinese 5 spice blend to sweet potatoes but they’re such a perfect fit! This dish looks incredibly creamy and decadent but is so healthy-definitely proposal worthy! It really is a great combo Meg. Hope you try them! Very nice spin on mashed potatoes. Love it! Thanks Derek! Hope you have a great day. 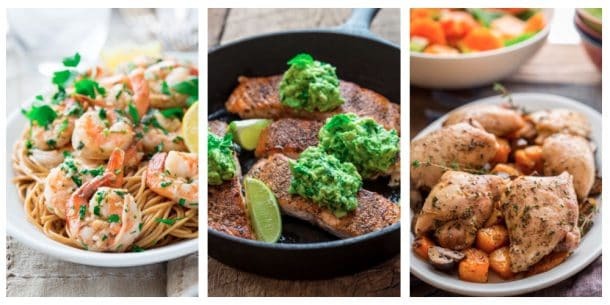 These look AMAZING!I definitely have to try this recipe. Thanks so much Evi. I hope you do try them. These sweet potatoes look incredible! A perfect addition to the Thanksgiving table. I love that you steamed them to preserve the nutrients and toasted the spices. Tara! Thanks so much. I always dig into the sweet potatoes on Thanksgiving. One of my favorites! 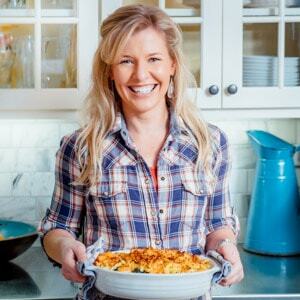 We love savory sweet potato dishes! These sound so good! Thank you so much Jessica! Hope you have a great day. So many awesome recipes here. Thanks you!